Garland Trends! it is popping up for any event or wedding. 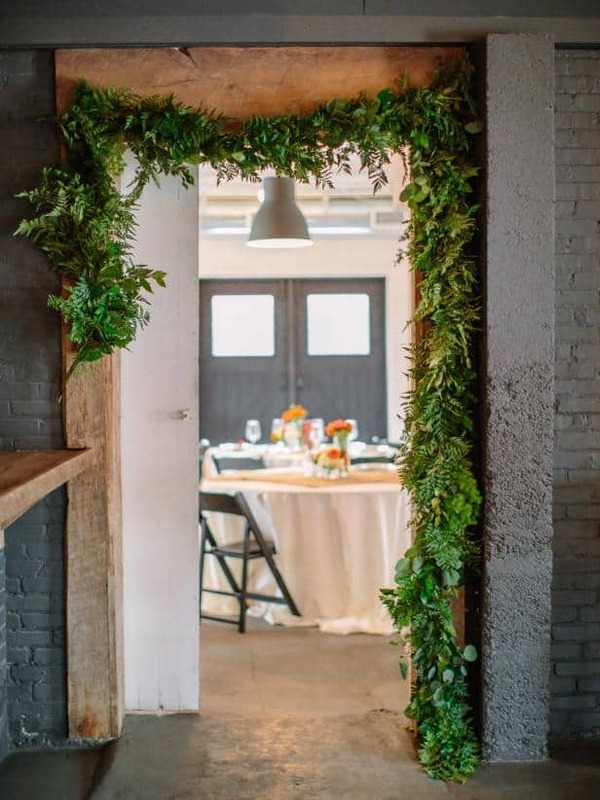 There are several types of greens you can pick from to make your garland and various ways to use them for your event. The most popular DIY garland green is seeded eucalyptus and/ or silver eucalyptus. Mixing greens will give your garland depth, texture, shape, and beautiful tone. Here are some recommendations of popular greens to craft your garland; ivy, olive branch, lemon leaf, pittosporum, ruscus, sprengeri fern, plumosa, and bay leaf. Be careful about using too many greens that are strong in scent. The smell can become overpowering! DIY Garlands are a perfect choice for multiple uses. 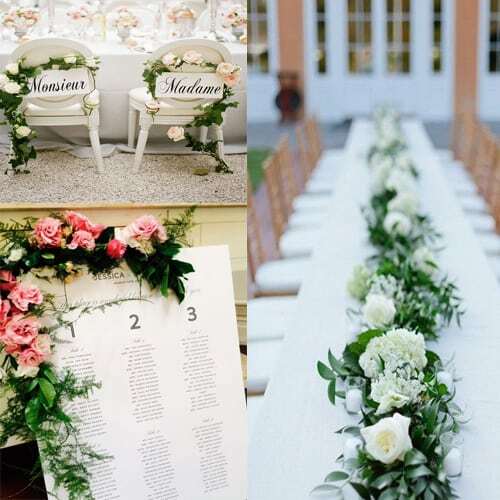 They can be minimalist or be filled with lush flowers to decorate tables, arches, chairs, seating charts, doorways, and chandeliers. They can be super easy to make and very affordable! Depending on the size and style you plan to make, remember…. they can take time to prepare. 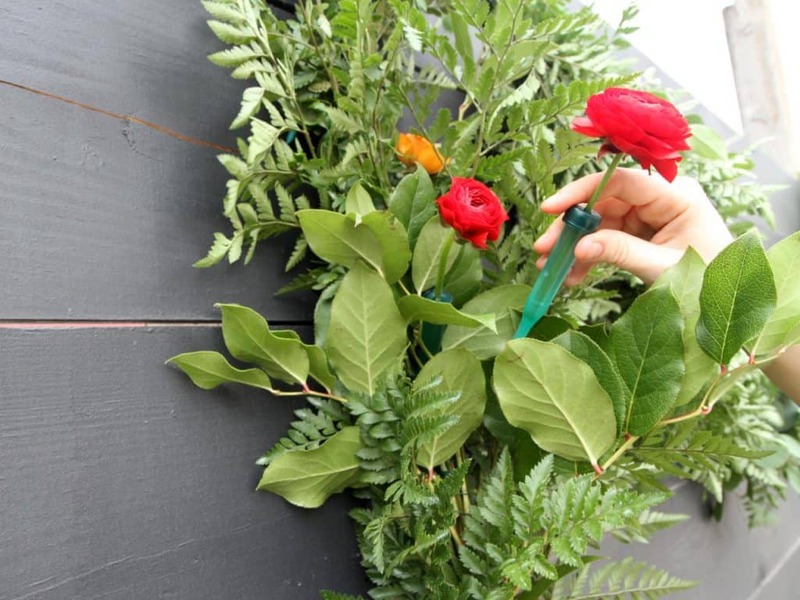 Here are some fantastic ideas and tricks when you making your garland! There are all different foam products available to purchase when you make your garlands. If you are using flowers in your garland, brick trays with foam blocks will help keep your garland and flowers hydrated during your event. Insert the greens and flowers into the wet foam. When using the foam trays place them apart a couple of feet and fill in the empty space with the greenery between each tray. Use floral wire which is a versatile wire to secure your stems together. Oasis Iglu small foam holders work perfectly for narrow table garlands or to attach the garland to any surface. 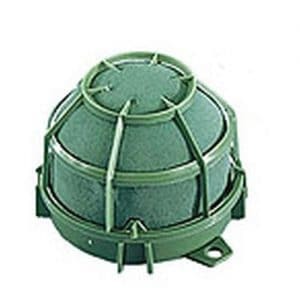 The Iglu holders come in small and large. They can be used to design flower arrangements for wedding chairs, cake toppers, pew decorations, candelabras, wreaths and much more. Oasis 9’ garland is perfect for designing floral archways, gazebos or doors. 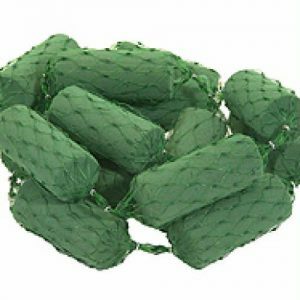 The 5” x 2” cylinders are made with Oasis foam and are held together with flexible netting. You can cut them to fit any desired space and or garland length. This pretty, minimalist look is quite affordable and fashionable!!! Cut greenery in individual pieces the same length and remove an inch of the leaves off the stems to be able to wire them together. Gather stems in small bunches 3-5 stems and wrap the ends to cluster the stems together. You can use Oasis wire to act as a spine for your table garland. The green floral wire will blend in with the foliage so you cannot see it. Floral wire is used for multiple purposes and is very helpful!. Floral wire is measured in thickness or gauge, The lower the gauge of the floral wire, the thicker the wire. The thicker the wire, the less pliable it will be. For garlands, we would recommend 24-26 gauge. If you are using rustic wire as the spine of your garland, we would recommend 18 gauge. We have great recommendations for flowers you can use for your garlands such as roses, lisianthus, snapdragons, stock or big blooms such as peonies, garden roses, and hydrangeas. Remember, some blooms need a water source to stay lush and beautiful, especially in the heat. If you choose not to use flower foam in your garland, consider using water tubes to keep your flowers hydrated…. Especially if it is hot! After finishing wiring greens together, tuck in the water picks with the flower stems under the wire to secure them and hide the water tube. Here is a trick, when securing garlands to doorways, arches, chuppahs, chairs or wherever you desire, use zip ties or pipe cleaners. Make sure you attach the garland securely. You can cover it with ribbon if needed. Check out our tutorial, How to Make a Flower Garland! 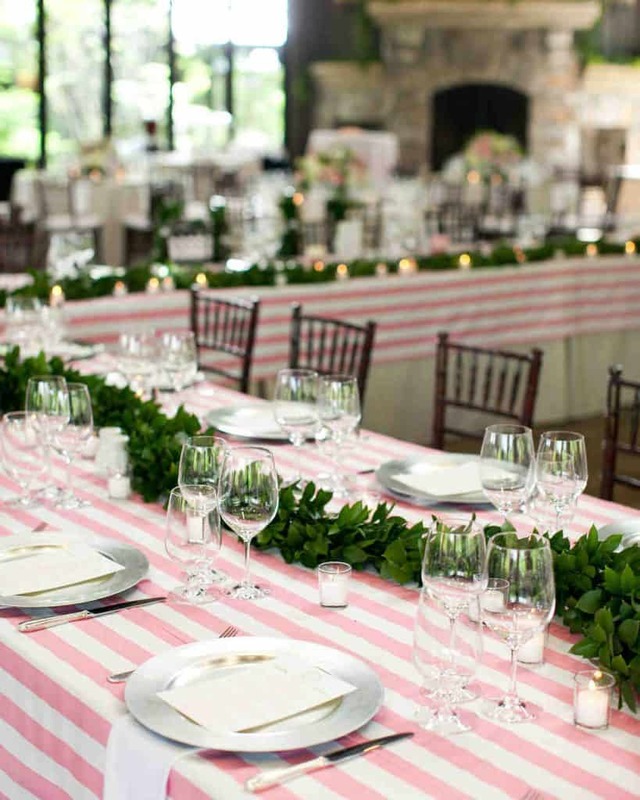 Well said.. Minimalist garland is the most commonly used for wedding receptions.